We hope everyone made it through the summer and fall safe and sound and hope that everyone is getting ready for our annual Ice fishing contest coming up on January 19, 2019. We do need help for this so any of you that can volunteer, please let me know!! We purchased many posts for a lot of the signs that we and the local businesses pitched in for and have been put up through out the area where needed. It was a lot of work for the men who helped get them in place and we would just like to thank those men again. We also bought more gravel and rock and filled in the bigger holes again over on the trail by the Elkhorn and also in one other spot not far away. We will be holding another poker run this coming year starting May and ending the day of our brat feed which is set for August 17, 2019 and will need volunteers for this event. We need more people to step up and help out as the same people are getting tired of doing it all. The lack of volunteers will mean the lack of events for the club. 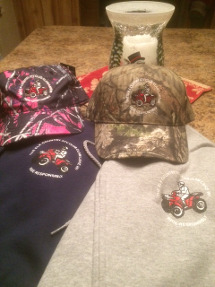 We do have our Hooded zip up sweatshirt in Navy or grey and our men and woman hats. 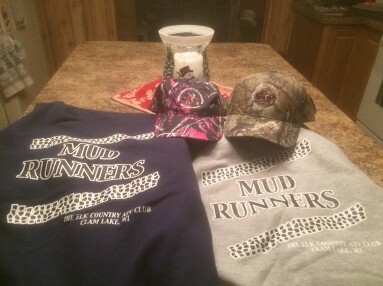 The Sweatshirts are SMLXL for $44 and the 2XL is $46 the hats are $16 a piece so if you want one saved please let me know. June 15th,2019 is our overnight ride to Lake Superior. We will leave the Elkhorn at 8:00 am and we have a small block of rooms reserved at the Sleepy Hollow, South Range, WI. So if you are planning on joining us, PLEASE call 715-398-6989 right away and reserve your room. Make sure to ask for one of the rooms reserved under Patricia Dudley. The cost of the rooms are $75.01 for 2 double beds. Please call us if you have any questions. 715-794-2298. Plan on bringing snacks & fluids, etc. We will stop somewhere along the way to eat. September 28th Our last Club ride for the year. We will be riding to Louie's Landing on Moose Lake and we will leave the Elkhorn at 8:00 am. Plan on eating there or bring your own. Front of Sweatshirt Back of Sweatshirt. Your Club Officer's who were elected in this June are as follow's!